Yesterday, Judge Hansen from Texas temporarily issued an injunction against President Obama’s Administrative Relief program 2 days before the implementation of an expanded DACA program that would enable additional “Dreamers” (undocumented youth brought here as children) to have temporary protection from deportation, a social security number and a work permit. The DACA program, announced in the summer of 2012, has already had a dramatic and positive impact on the lives of thousands of young people in our community and state, allowing them to “come out of the shadows” and contribute to the well-being of our community. The new DACA program will expand the number of young people who are DACA eligible and, under Deferred Action for Parents of Americans and Lawful Permanent Residents (DAPA) a similar temporary protected status will be available for the parents of U.S. citizen children. In addition to benefitting the recipients themselves, the UCLA North American Integration and Development Center has estimated that legalizing the work of DACA and DAPA recipients in Los Angeles county would cause their collective wages to grow by more than $1.6 billion and generate more than $1.1 billion in new tax revenues. Los Angeles County is home to almost one tenth of the US’s 11.4 million undocumented immigrants and an estimated 466,000 undocumented Los Angeles County immigrants will be eligible for either DACA or DAPA when the program is implemented. Our organization, the Long Beach Immigrant Rights Coalition has been preparing to meet the demand of the expanded DACA program that was to have begun on Wednesday, Feb. 18. We have hosted forums, given presentations, and organized legal clinics. We will continue to do our best to prepared potential applicants for the new programs while the decision is appealed and while we remind the larger community that these are real people’s lives that are being affected by the decision. Without these new programs, parents will continued to be separated from their children through deportations and young people will have their lives and dreams placed on hold by not having access to legal status. Our community needs the full participation of our large and diverse immigrant community—the students, workers, mothers, fathers and children who on a daily basis contribute to making this a vital and more productive community, state and nation. DAPA and DACA are limited programs in that they are temporary and only cover a certain portion of the undocumented community, they are nevertheless the victories of our vital youth-led grass roots movement and they are important steps on the way to much needed comprehensive immigration reform. 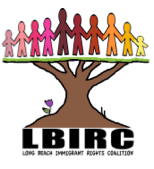 We, the members of LBIRC will continue to work with passion and commitment for a more tolerant, loving and humane community where the talents and energies of all our residents are welcomed and for a nation where families can stay together, regardless of the immigration status of their members. When people no longer have to live in fear, when families know they can stay together, and when young people have the opportunity to realize their educational dreams and follow their career paths, we will all be the beneficiaries.